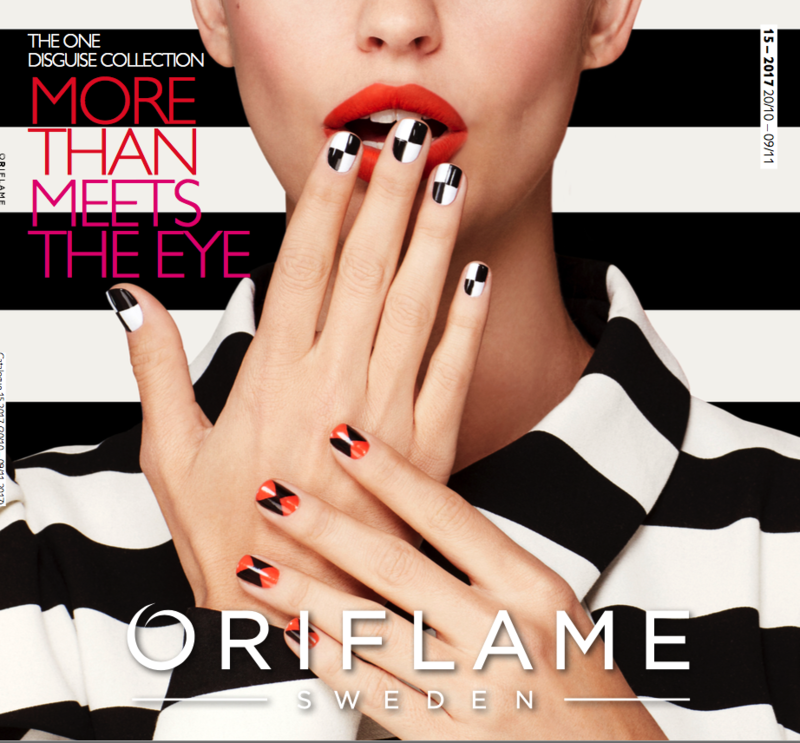 The Oriflame Catalogue 15 of 2017 has arrived and is surely the trendiest of the year! Beyond the obvious is Disguise The ONE, a Collection of Accessories, Makeup and Fragrance, created in collaboration with one of the best fashion schools in Europe – the Royal Academy of Fine Arts in Antwerp. The modern interpretation of the optical illusion trend of fashion student Rushemy Botter was selected for the creation of Disguise The ONE. The Eau de Parfum Disguise the ONE is an irreverent and intense fragrance, full of vibrant and sophisticated notes. This fragrance is the gateway to a world where all eyes will be on you. Within this collection, we present 3 new shades of one of your favourite lipsticks – the Mate Lipstick Mousse Lip Sensation The ONE. These new tones will add intensity to the Autumn days. Transform and show your most fearless side. Also find the four new shades of the Long-Lasting Varnishes The ONE, for only £ 4.95 each. With the arrival of the cold, it is essential to offer the skin a moisturizing and nourishing care, for a radiant and revitalized look! Thus, we propose in this catalogue the dream deal that should not be missed! For every £20 of purchases you make in this catalogue, you can purchase the new Intense Skin Recharge NovAge Night Mask for £11.95. Formulated with Inca Inchi Oil, Capuaçu Butter and the much-desired Hyaluronic Acid, this Mask provides “8 hours of beauty sleep in a bottle”. Recommended for all ages and all skin types. For only £2.45 you can also purchase the Facial Mask Spatula with a silicone tip, perfect for a hygienic application without waste. I also take this opportunity to draw your attention to the special promotion of the Bronzing Pearls Giordani Gold, for only £ 11.95 each. Have you tried the CC Cream in HairX Spray? They are 150 ml. of 10 essential benefits for healthy hair. This spray repairs and moisturizes the hair, giving it shine, softness, beading control, colour and body protection, helps to untangle, prevents spiked tips, controls stubborn hair and has a thermos protective function. If this is not already on the list of your favourite products, take advantage of the super discount of this catalogue and get this little treasure for only £3.95. Exquisite firmer care for only £11.95. Royal Velvet enhances the contours of the face, leaves the skin firmer and visibly reduces the appearance of fine lines and wrinkles. Recommended from the age of 40, so that a firmer skin is part of your reality. For them, we also have the best deals! Buy a Deodorant Spray and get another one for free! Essential nutrients for healthy and gorgeous nails and hair for only £16.95! The Nutritive Complex for Hair and Nails Wellness by Oriflame is on sale and, as a matter of secrecy, I can tell you that this is the lowest price by the end of the year …. And during the beginning of next year too! Take advantage of this promotion now! On the back cover, we present a Special Edition of Feet Up, this time with an irresistible aroma of cherries. For only £ 2.95, soften and revitalize your feet!